Bollywood has one of the most talented and osm singer of the recent times and yes we are talking about our best singer that is none other than Neha Kakkar. She is the most popular singer in India. She has sung a lot of popular peppy tracks be it Punjabi or Bollywood remakes. Neha Kakkar was born on 6 June 1988 is an Indian Singer. She competed on season 2 of the television reality show Indian Idol in 2006 and was a judge in the tenth season of the same show. She also appeared in Comedy Circus Ke Taansen in 2014 on Sony TV. She had judged a singing reality show on Zee TV named Sa Re Ga Ma Pa Lil Champs. In 2008, she launched her first album, Neha-The Rock Star, whose music was composed by Meet Bros. her other work includes the songs “ Sunny Sunny” from movie Yaariyan, “Manali Trance” from a movie The Shaukeens. Neha Kakkar grew up in Delhi and studied at New Holy Public School. When she was a student of class 11 Kakkar was passionate about the music since early childhood. she begins singing when she was only four. Her recent song Aankh Maare has grabbed everyone’s like and it is being said that she will soon in a song opposite Bigg Boss 11 fame Priyank Sharma. It was her curly hair, cute smile and jolly when she initially hit the industry her look caught everyone’s attention but soon with the passage of time and popularity and now that the social media is filled with pictures of people sharing their #10 Year Challenge where everyone is happy to see the change in the personality. 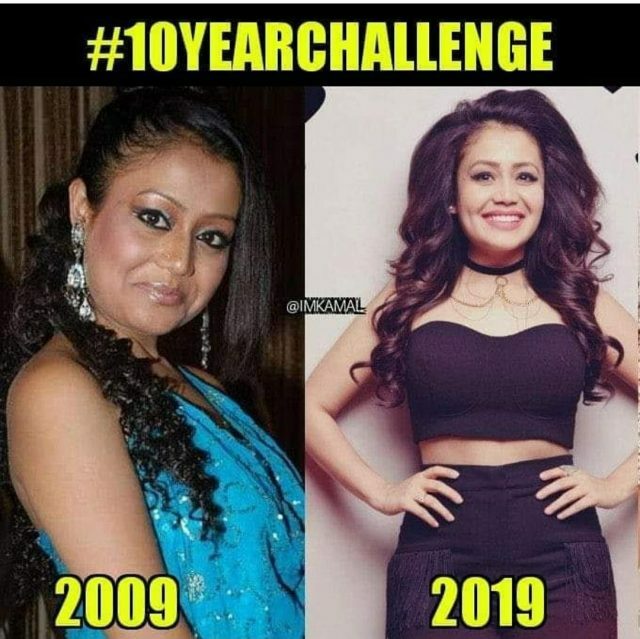 Neha, however, has not shared her picture on the social media with the challenge but a picture of hers has been doing rounds on the internet where her changes over the years are quite visible.